Well straight away its a big improvement in that it looks clean and bright and once you have selected your location it offers a nice picture header. So I search for the 3 and get a choice of several journeys which of course split the 3 into the two separate routes it now is. You get a full summary of the next journey on the route, and a map which you can zoom in . There links to download the page as a pdf or just print / email it. 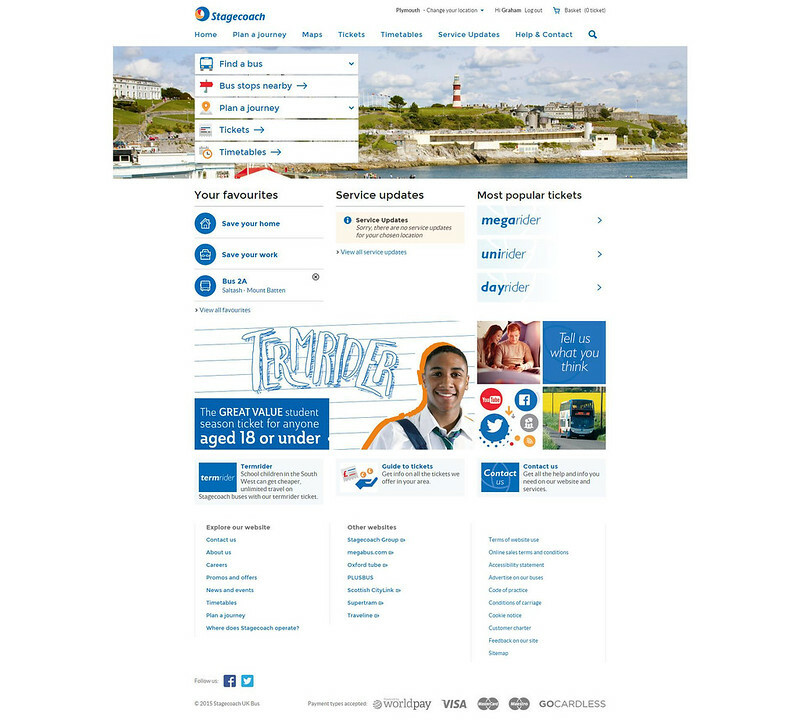 There is also a nice section for any planned service updates for the route. So what about Planning a journey? So we are looking for a bus from Derriford Hospital to Tavistock in the morning. OK., so its not perfect, but its a lot better than the old site. It couldn't find Tavistock, but at least it offered me the alternative – “Tavistock Devon” which is close enough! Nice and friendly and pretty easy to use. which gives you handy links to alternative journeys, full timetable downloads and the option to save as a favourite which means you get easy access to the info you need. I have found one or two little quirks but all in all it just works pretty well. It will be interesting to see how I get on with it over the coming weeks when I start using it ‘in anger’ rather than just playing around with it, but on first impressions its a winner for me. It does have to be said that the old site was so bad that this couldn't really fail to be an improvement, but all in all its a good job so far! I had a "play" with it yesterday, on the "Swindon" version with much the same results - a few oddities, but overall very good. I set locations for "home" and "work" and buttons appear saying "take me home" and "take me to work" as a shortcut to a journey planner. 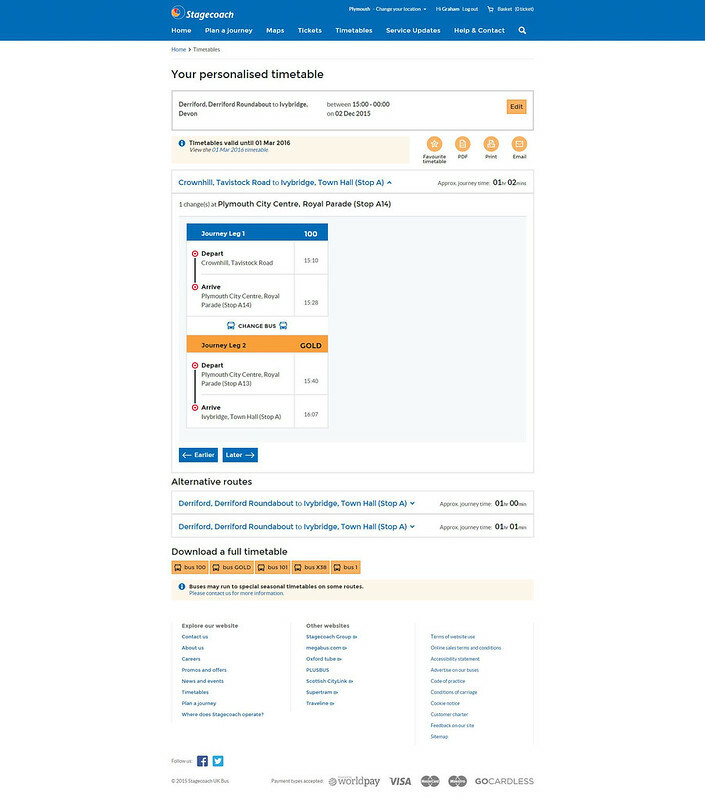 Stagecoach West buses are reporting in real time, and that shows on the website, including linking bus workings across journeys so on the 49 Devizes - Trowbridge section predicts times even when the bus is on the Swindon - Devizes part of the split registration. As I was within sight of a 49 bus stop the accuracy was checked and found to be very good (its only an hourly service so not possible to check many trips) and the website updated to show the bus had arrived when it was less than half a Scania E400 length from the bus stop! Incidentally, the photo of the bus on the right of the home page screen shot is a 49 "Trans-Wilts Express" pulling out of Bishops Cannings between Devizes and Avebury on its way to Swindon. There's been a lot of work behind the scenes to try and get the fares element to work. 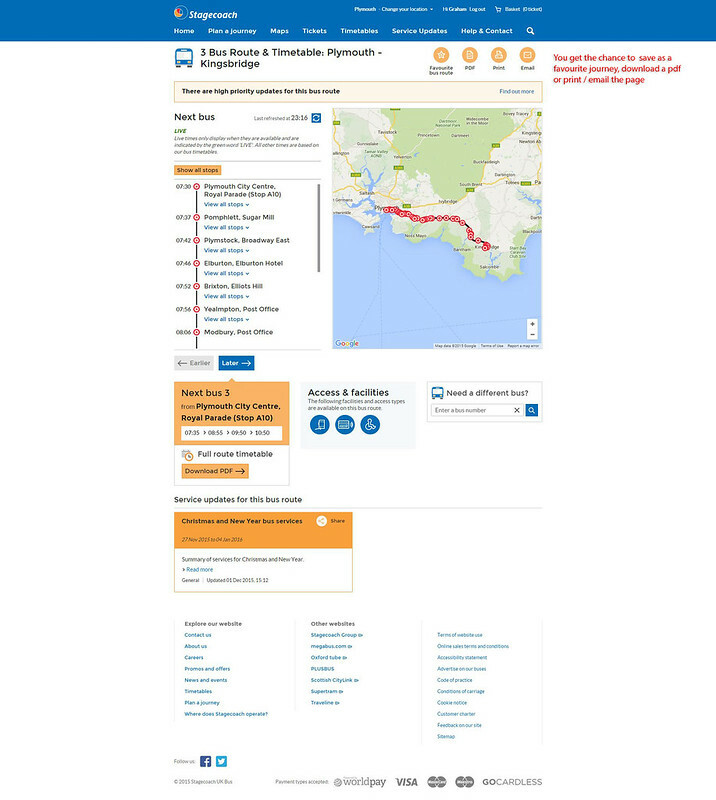 The Derriford-Tavistock example is I think one area where it is a little off-beam - if I have understood its availability correctly, the "best value" Plymouth Skipper ticket does not cover the whole journey. Graham. The 3 is NOT two separate routes. It remains one through route. The web site is WRONG WRONG WRONG. Nationally its data management is weak. Like most modern web sites, it may look pretty but is does a poor job of helping you find information - unless, of course, you know what you are looking for in the first place. fatbusbloke - I'm afraid you are wrong, the 3 is registered and operated as two separate routes. The two routes connect at Kingsbridge where there is a short break (sometimes 8/9 minutes), and on most journeys the connection is guaranteed (by being the same bus) and through passengers may remain on the bus. Buses leave Plymouth showing the destination "Kingsbridge", this is changed at Kingsbridge to show "Dartmouth" as the destination. The same thing happens visa versa. The destination is also qualified by showing "for Dartmouth" or "for Plymouth" as appropriate. Of course at times the "Break" in the service may not be noticed by passengers if the service is running late. Prior to Stagecoach, the 3 was First 93 and the GOLD was First X80, these two also used to be split into two services, as detailed above. Of course, the passengers don't care if it's a split registration - if they want to go from, say, Dartmouth to Plymouth then all this 'Kingsbridge for Plymouth' stuff, along with strange and unnecessary symbols on the printed timetable (with utterly irrelevant - to them - stuff about 'regulations') will only put them off. It's only a separate route if you have to get off the bus!! I agree with FBB. Try finding information for somewhere not your local area. It doesn't even recognise "Manchester" when you enter it under Change Your Location. Its working fine you only need to go to main menu it will show operating areas. It does recognise Manchester, I just tried it. Seems to have links to a real mish-mash of timetable styles though, from the easy-to-read 'old-style' bespoke ones through to the incomprehensible (probably computer-generated) new ones full of exclamation marks and jargon like 'Prd1'. And some of their new maps are atrocious - the 'West Network Map' for instance, which just has lots of lines on it with no indication of which route goes where.